The Fragile X Association of Southern California was formed in 1996 to promote public awareness of Fragile X Syndrome with special emphasis on educators and health professionals; provide a forum for families of children with Fragile X to meet and share their ideas, concerns, and problems; and support scientific research on Fragile X Syndrome. We are run entirely by volunteer parents of children with Fragile X Syndrome, and are a California non-profit organization. Though our official mailing address is in Burbank, our membership is actually spread out among Ventura, Los Angeles, Orange, Riverside, and San Bernardino counties. As an association, we participate in resource fairs and other community events throughout Southern California several times per year. We also hold Family Fun Days 4-5 times per year, at different locations within our membership area, where families affected with Fragile X can get together and enjoy activities like bowling, picnics, etc. while getting to know each other. In addition to our Family Fun Days, we periodically host informational seminars for our member families and local professionals, bringing in speakers on important topics such as behavioral interventions for children with Fragile X, legal issues including conservatorship and estate planning, genetics, Fragile X related conditions, drug studies, and more. We also helped to establish, and continue to support, a Fragile X clinic at Miller Children’s Hospital in Long Beach. Our board of directors meets quarterly. We encourage you to attend one of our board meetings; if interested, please email us at fragilexassociation@gmail.com for more details. 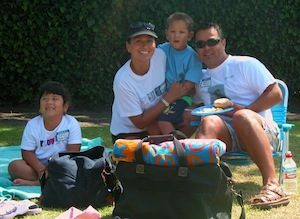 Fraxsocal.org has been serving the Southern California Fragile X community online since 1998. Our organization was formed to promote public awareness of Fragile X Syndrome with special emphasis on educators and health professionals; provide a forum for families and children with Fragile X to meet and share their ideas, concerns and problems; and support scientific research on Fragile X Syndrome.